Rice Lake Sports Hall of Fame eighteenth induction banquet at Lehman's Supper Club, December 2, 2018. 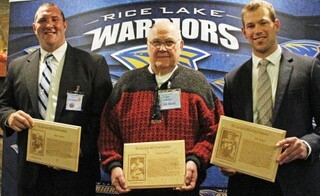 From left; Inductee Ben Knepper, Ed Olund accepting for Inductee Harvey Ankley and Inductee Rob Berger. We are pleased to announce that the following nominees have been elected by the general membership for induction into the Rice Lake Sports Hall of Fame Foundation. Harvey graduated from Rice Lake High School in 1960. He was a multiple letter-winner in three sports for the Warriors; 4 in baseball, 3 in football and 2 in wrestling. Harvey started his baseball career with the Brill Millers in the 7th grade, and then under the guidance of coach and area baseball scout, W.C. “Stick” Olson, he played on the American Legion Baseball Team. Harvey developed into one of the finest catchers in Rice Lake High School baseball, being a part of one of the best pitcher-catcher duos for the Warriors, with Terry Olson. A tough competitor who batted left and threw right, Ankley stood 5’ 10” and weighed 185 pounds. 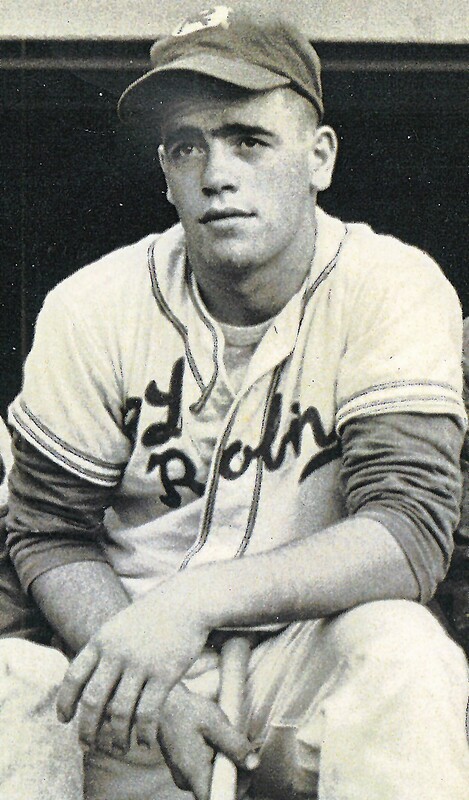 While as a player for the American Legion team, he was chosen four consecutive years to represent Northern Wisconsin in the Hearst All-Star Silver Sluggers program, and as a senior in 1960 was honored as a catcher in the 18 year old All-Star game at Milwaukee County Stadium which was held before the Braves and Chicago Cubs game. Harvey went on to catch for the UW-River Falls baseball team in 1962, 63 and 64. In 1964, Harvey’s junior year, the Falcons won the Conference Championship and were 8th in the Final NCAA Division III rankings. He was recognized as Honorable Mention on the All American baseball team. That summer he caught for the Minneapolis Millers Amateur Baseball Team for college players and former major leaguers. In 1965 a car accident prevented Harvey from continuing to play sports during his senior year at UW-River Falls. In football, Harvey was co-captain for the 1959 undefeated (8-0) Warrior football team that allowed only 19 points and was ranked #8 in the final one-class state rankings. He played on both sides of the line as offensive guard, defensive tackle and line-backer, and was All-Ho’N and All-Northwest. At UW-River Falls he was a 2 year starter, in 1963 and 64. In wrestling at RLHS he lettered in the 185# class when the wrestling program began in 1957-58. Harvey graduated from UW-River Falls with a degree in Agriculture in 1966. After working in Germany for 3M, he moved to California where he and his wife Janet and family presently reside. Rob graduated from Rice Lake High School in 2007 as a three-sport athlete in football, basketball and baseball. He quarterbacked the Warrior football team for two years and still holds the record for the longest pass from scrimmage; 95 yards against Hudson. Rob was a two-year starter on the basketball team that won two Big Rivers Conference Championships which went deep in the play-offs. He started for three years on the Warrior baseball team at shortstop and first base. As a senior, Rob was chosen captain for football, basketball and baseball. Rob took his athletic talent to St. Norbert College in De Pere, WI, playing both football and baseball. He was given an opportunity to punt as a freshman. and was selected to All-Midwest Conference 1st Team Punter in 2008 with a 37.8. He continued to rewrite the Midwest Conference and St. Norbert College history book. In 2009 Rob was All-Midwest 2nd Team quarterback and ranks first all-time St. Norbert history for total offense in one game; 443 yards vs. Wartburg. Rob was chosen Team Most Valuable Player in 2009 and 2010. In 2010, he was selected Midwest Conference “Player of the Year” and 1st Team All-Midwest Quarterback. He was also Midwest Conference record holder for yards and carries by a quarterback in one season at 6.3 in 2010. Other accomplishments at St. Norbert include 2010 Captain, ranks first all-time in SNC history with 2,892 total yards in one season and completion percentage of 62%. 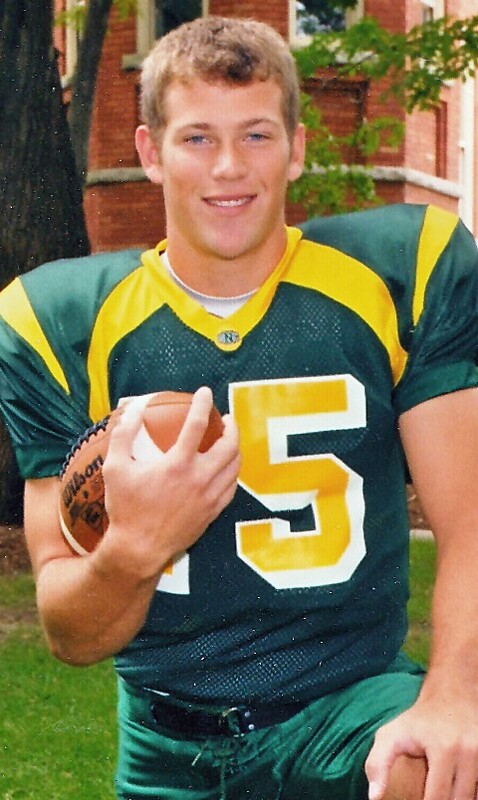 Rob also ranks 3rd all-time in SNC history for career touchdown passes with 50 from 2007–2010. Coach Don Maslinski writes, “Rob was one of the most complete athletes in the history of St. Norbert College football. He possessed outstanding leadership traits. All his teammates believed in him and his abilities.” Rob currently coaches QB/FB for the Rice Lake Warrior Football team. As an assistant, he helped take them deep into the play-offs and a State Championship in 2017. Since 2011, Rob has been playing baseball as shortstop for the Haugen Knights. He currently lives in Rice Lake and is employed by Edward Jones Investments. Ben graduated from Rice Lake High School in 1999, lettering two years in football, wrestling and one year in basketball. He was Honorable Mention All-Big Rivers his senior year in football. In track, Ben was Team Field MVP and sectional qualifier in the shot. Ben attended UW-Stout in Menomonie, WI. As a 6’ 4”, 305 pound tackle, Ben led interference for the Stout backfield. In his junior year, Ben played 700 plus plays and only allowed one quarterback sack in addition to having 65% of the running plays come behind him. He was D3 Football Don Hanson All-American, and unanimous First Team All-WIAC selection. As a senior, Ben was elected captain. He gave up zero quarterback sacks and recorded 25 pancake blocks. Again 65% of the running plays followed “Big Ben”. He was honored to many D3 All-American teams as well as unanimous First Team All-WIAC Offensive Tackle. Ben was selected as a member of the WIAC Centennial All-Time Football Team in 2012 and was inducted into the UW-Stout Hall of Fame in 2014. Ben was also a member of Team USA in the Aztec Bowl (D3 All Star Game) versus the Mexican National Team in 2004. 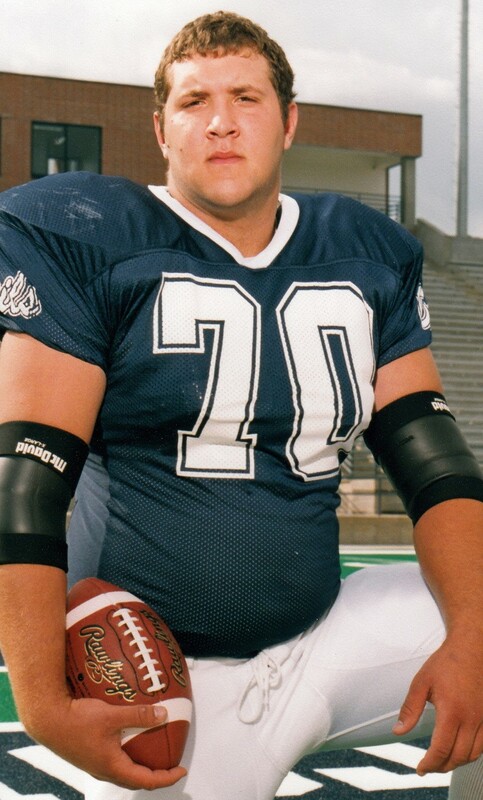 UW-Stout offensive line coach, now Northern Illinois head coach Rod Carey states, “In my opinion, Ben is the best offensive lineman to ever play at Stout and one of the top 5 to ever play in the WIAC Conference. I believe Ben could have played on any of the lines I have coached. Ben taught me that you could be a big, mean offensive lineman on the field and still have a heart the size of Mt. Rushmore. He is one of the classiest men I know and am really proud to call him a friend.” Ben graduated from UW-Stout with a degree in Business Administration in 2004. He lives in Chetek, is active in the community and is an assistant football coach at Chetek Weyerhaeuser High School.